Over 10 years ago, we facilitated our first team building workshop which taught basic balloon twisting skills and then applied them to a variety of challenges. 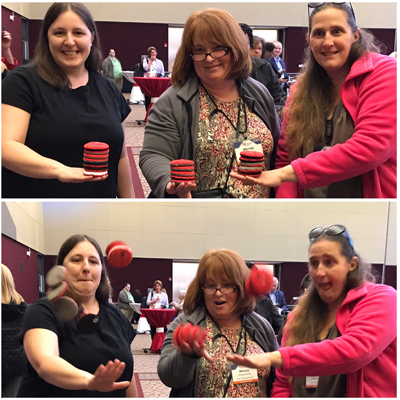 In our excitement for juggling and skill toys, that workshop took a back seat. The time had come to dust off the balloon pumps again. We participated in WithersRavenel's annual Owner's Day event two years ago and they invited us back. We wanted to surprise the 200 plus person team with something new and unexpected. 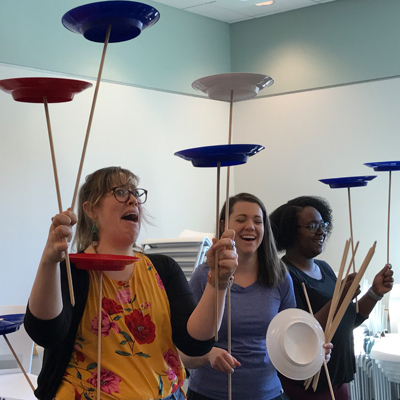 The first half of our workshop included lots of flops (flop ball exercises, of course) and the second a few pops (an inevitable part of balloon twisting). "Once again Flow Circus comes through for our annual company meeting! 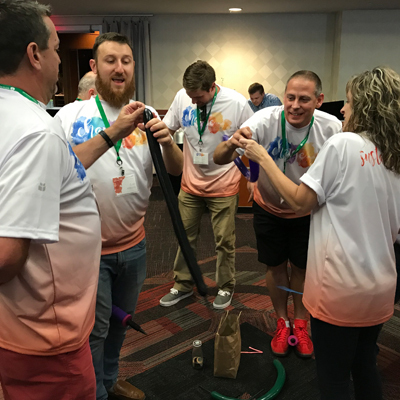 Our firm enjoyed working with the Flow Circus team on an afternoon of team-building activities that kept our employees laughing, determined and engaged. The span of activities enabled our most seasoned employees as well as our new career employees to participate in a meaningful way. Looking forward to seeing what else you have up your sleeves at Flow Circus." Chan Bryant, Senior Vice President, WithersRavenel, Inc.
We'll be doing the workshop again later this week for a bank's regional meeting. Looking forward to seeing the smiles and childlike expressions that always appear as balloon dogs get twisted and the professional armor gets dropped for a little while.